A Rooftop Reception With A View! 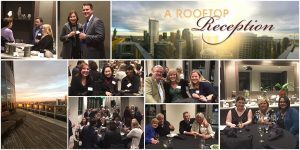 This week Parker, Smith & Feek along with our Assurex partner RCM&D/Sisco hosted a Rooftop Reception spending a wonderful evening with friends celebrating the healthcare industry. This event followed a much larger event, the American Society for Healthcare Risk Management (ASHRM) Annual Conference, and Exhibition, connecting industry professionals with the leading innovations in health care to reduce risk, improve patient safety, and create value for healthcare systems. The national event brings together industry professionals and thought leaders in healthcare risk management to share their successes, challenges, and best practices.